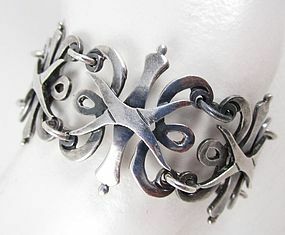 This lovely vintage bracelet was made by Taxco maestro, Pedro Castillo. It is 6 3/4" long x 1 3/4" long and is handcrafted from sterling silver. It has an attached safety chain and the box closure is hallmarked "Taxco Hecho en Mexico CP Sterling 925". It is in excellent condition.